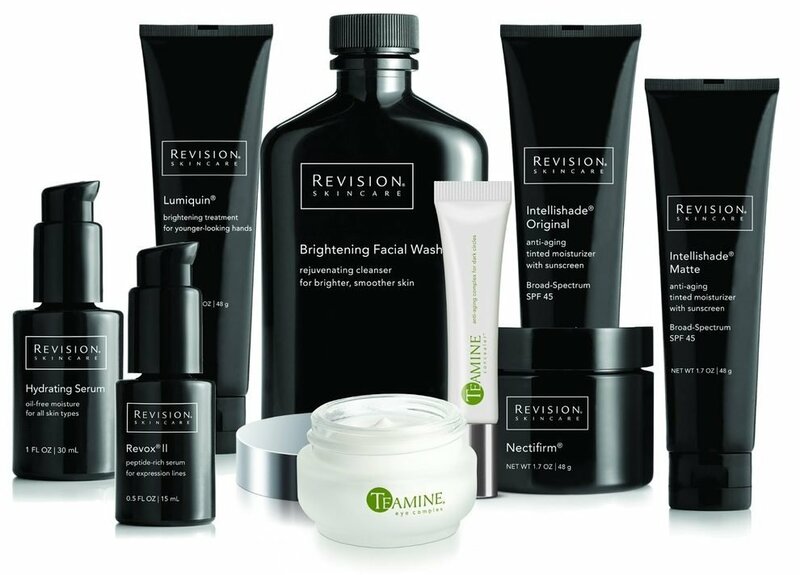 Revision Skincare is a high quality skin care line based out of Dallas, Texas. They have been formulating highly effective, clinically-proven products for over 25 years. These products represent the furthest advancements in scientific skincare, with formulations rooted in rigorous research and testing. IntellishadeⓇ Matte – Outsmart signs of aging with this award-winning tinted moisturizer that gives skin a touch of sheer, healthy color. Formulated with a blend of three peptides and broad-spectrum UVA and UVB protection, it’s the smart way to care for your skin. Fights photodamage that causes premature aging. IntellishadeⓇ Original – Outsmart signs of aging with this award-winning tinted moisturizer that gives skin a touch of sheer, healthy color. Formulated with a blend of three peptides and broad-spectrum UVA and UVB protection, it’s the smart way to care for your skin. What cleansers and toners do you carry? Brightening Facial Wash – This ultra-rich cleanser with Alpha and Beta Hydroxy Acids and brightening botanicals removes the day’s impurities, leaving skin clean and hydrated. Brightens skin with radiant-boosting Vitamin C and extracts of Licorice and Lily. Cleanse skin without stripping it of its natural moisture content. Exfoliating Facial Rinse – This highly concentrated, invigorating toner deeply cleans pores by sweeping away excess oil and impurities. Exfoliates and purifies the skin with Glycolic and Salicylic Acids. Contains a blend of Marine Seaweed, Aloe Vera, and a plant-based Polysaccharide. Refreshes and brightens dull skin for a more youthful appearance. Gentle Cleansing Lotion – This mild, creamy cleanser removes makeup, dirt, and debris without upsetting the skin’s delicate moisture balance. Skin is left feeling clean, smooth, and hydrated. Conditions skin with marine-derived red and brown algae. Purifying Cleansing Gel – This highly concentrated face wash deeply cleans pores and gives skin a cleaner, more matte complexion. Soothing Facial Rinse – This calming, oil-free formula gently hydrates and refreshes skin after cleansing without making it feel dry or tight. Hydrates and conditions skin with a blend of plant and Algae Extracts. Contains a blend of Arnica montana Extract, Grape Seed Extract, and Vitamin K.
Keeps skin at its optimum pH level. Black Mask – This innovative mask with a moist after-feel deep cleans the skin, ridding it of impurities and excess sebum. Purifies and soothes skin with unique properties of silt derived from European freshwater lakes. Leaves skin looking polished and smooths. Finishing Touch – This serious facial exfoliation scrub removes dead, dehydrated surface cells from the skin for an immediate soft, smooth appearance. Exfoliates skin with Polynesian Volcanic Black Sand and ultra-fine Pumice. Contains freshwater silt that hydrates, nourishes, and helps absorb impurities. Leaves a moist, clean feel after rinse-off, unlike most scrubs. What creams, serums, and Retinol do you carry? DEJ Eye Cream™ – Advanced extracts, peptides, and potent antioxidants work cohesively to create clinically-proven results. Reduces appearance of wrinkles with clinically-proven peptides. DEJ Face Cream™ – This cream contains a proprietary ceramide blend, specialized herbal extracts, and a unique peptide combination for proven results. LumiquinⓇ – Take time off your hands with this nighttime formula packed with powerful anti-aging ingredients and antioxidants. Brightens the skin and minimizes appearance of imperfections. Enhances skin’s moisture level (hands look smoother). NectifirmⓇ – This best-selling neck cream contains plant extracts, antioxidants, and unique biotechnological blends that work cohesively to create a smoother, younger-looking neck. Helps skin appear more firm and lifted. Reduces appearance of rough, crepey skin. Retinol Complete™ 0.5 – This revolutionary facial serum contains the power of five antioxidants and includes a proprietary blend of botanical extracts that enhance the effects of Retinol. Brightens, plumps, and smooths skin’s texture. Retinol Complete™ 1.0 – This revolutionary facial serum contains the power of five antioxidants and includes a proprietary blend of botanical extracts that enhance the effects of Retinol. Revox™ 7 – This age-defying, oil-free serum is uniquely formulated to reduce the appearance of expression lines in the face. Softens the look of expression lines around eyes, forehead, and mouth. TeamineⓇ Eye Complex – This cream was formulated to effectively address the appearance of dark circles in multiple ways. Visibly diminishes the appearance of dark under-eye circles. Brightens skin and provides antioxidant benefits. Vitamin K Serum – This lightweight, oil-free serum conditions the skin with Phytonadione, a very potent form of Vitamin K.
What moisturizers do you carry? Hydrating Serum – This ultra-light, oil-free serum is boosted with the benefits of smart hydration for a smooth, refreshed appearance. Provides short- and long-term moisturization. Alleviates tightness and moisturizes without leaving skin feeling sticky. Multi Protection SPF 50 – Keep skin protected every day with this lightweight, oil-free, anti-aging moisturizer. Formulated with three peptides and potent antioxidants to brighten your skin. Moisturizes skin with plant-based Polysaccharide, Squalane, and Sodium Hyaluronate. Restorative Night Cream – This nutrient-rich moisturizer is formulated with an exclusive selection of ingredients that hydrate and condition skin while you sleep. What vitamin products do you carry? Vitamin C 30% – This lotion is formulated with the most advanced form of Vitamin C for healthy, radiant skin. The 30% formula contains one of the strongest concentrations of Vitamin C available.